What a pass….1 minor fault! 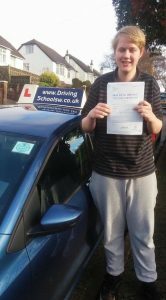 His Driving Instructor who works for The Diving School sw said “wow what an improvement only gained by working hard to put the 1st effort behind him, just ONE minor this time, we were both buzzing on the way home, well done young man and stay safe”. Contact www.thedrivingschoolsw.co.uk or call 01803 640607 for Driving Lessons in Torquay, Paignton, Brixham, Newton Abbot & surrounding areas.